The USC Price School of Public Policy and the USC School of Pharmacy continue to climb in the national rankings, further illustrating the schools’ successes and the pivotal role of the Schaeffer Center at the university as a recognized leader in health policy. The 2016 US News & World Report “Best Grad Schools” rankings were released online March 16th. Within the specialty “health policy and management,” the Price School ranked third (up from fourth in 2012) among Public Affairs schools nationally. Furthermore, the school jumped to fourth in the overall rankings of best public affairs graduate schools in the country (up from sixth in 2012). The School of Pharmacy also received high marks in the report, ranking ninth among pharmacy programs. USC School of Pharmacy remains the nation’s top-ranked private pharmacy school, and the top-ranked pharmacy school in Southern California. The school’s ranking increased from number ten in 2012. The Schaeffer Center plays a pivotal role for both schools’ health policy and economics programs. Since its inception in 2009, the Center has continued to attract nationally-recognized thought leaders as faculty and fellows including two Nobel laureates and produced evidence-based research that has directly impacted public policy. “We are proud of the great work being done at the Schaeffer Center and its impact on public policy. 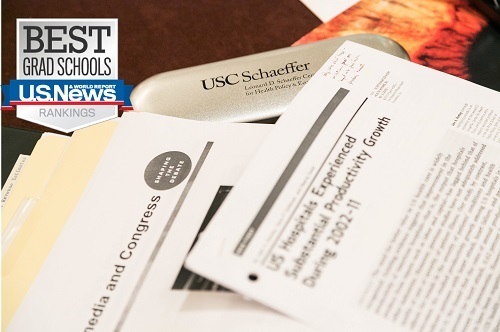 The US News and World Report ranking is another indication of the upward trajectory of the Center and our partner schools,” said Dana Goldman, Leonard D. Schaeffer Director’s Chair and USC Distinguished Professor. Within Public Affairs, 272 master’s programs in public affairs and administration were surveyed. The Pharmacy ranking is based on a survey of 125 Doctor of Pharmacy programs.